You can upload your story from April 5th 2019 onwards. All submissions must be received by August 9th, 2019.
Who can participate in the COME IN Award? The competition is open to all companies, NGOs and public authorities that support refugees’ and/or migrants’ employment. Owners or staff members of those organisations can apply for the award. The organisations must be registered in one of the following countries: 28 Member States of the European Union, Iceland, Liechtenstein, Norway, Switzerland, Turkey. Please use the submission sheet on our website. A preview sheet is available here. What kind of projects/ approaches can you submit? You can enter the contest with implemented, existing and planned approaches/ projects. Please describe your project/ approach with its (foreseen) impact on your company, and explain the sustainability and why it is innovative. What do you have to prepare for taking part in the COME IN Award? Your contribution should deal with innovative ways to integrate refugees and migrants in a workplace and/or to create a welcoming culture in a company. In what languages can you submit? The submission form will be only in English, but in direct contact with the partners, applications in partner languages can be accepted. Please consider that the conference will be held in English. By submitting a project, you accept that COME IN is entitled to publish the submitted projects on the internet or in other media also in modified form, and that your data can be electronically processed and published. All submissions must be in line with European copyright laws. Short quotes may be used if the source is clearly listed. Images, film, sound and other multimedia sources can be used if they were produced by you, if the author has given his/her explicit consent, or if they are freely accessible sources. What can you win at the COME IN competition? You can win: a two-day trip to Mechelen, Belgium – all travel, accommodation and subsistence costs for one person per winning project will be covered by the COME IN project. presentation of the award winners on the COME IN website and in the COME IN newsletter that will be published in autumn 2019.
reflects on/considers ways of measuring and documenting learner’s development in relation to integration competences. No appeal is admissible against the jury’s decision. Who will be invited to Mechelen? 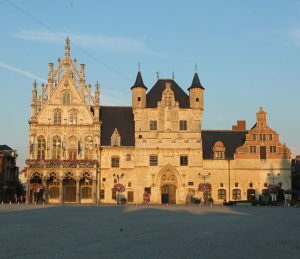 The person who submitted the application for their organisation will be invited to Mechelen. We will get in touch with you in end of August 2019. COME IN – Competences in Enterprises on Integration – is a two-year-project co-funded by the Erasmus+ programme of the European Union. Its main objective is to support successful labour market inclusion of refugees and migrants through enhancing employers’ competences and willingness to hire and integrate them to the workplace.